In this article you will find all the needed information to satisfy your curiosity on the subject of optical character recognition. OCR is a technology, which makes possible to recover data from a printed document, a PDF file or a picture captured. This means that you can convert documents into a searchable and editable data. After reading this manual you will be able to implement OCR succesfully with your C# camera application. To succeed, OZEKI Camera SDK has to be installed and a reference to OzekiSDK.dll has to be added to your Visual Studio project. Optical character recognition is used when people wish to recover data from a printed form for example: business cards, invoices, bank statesments, receipts and passport documents. With this function you can digitize printed text so they will be editable and storable. What is more, you will be able to publish these digitized texts on online surfaces and you can use them in computer vision applications, in text-to-speech or translation. The Optical Character Recognition function can be efficiently used in many fields. For example: converting written version of documents into textual version, making electronic documents reachable and searchable. Furthermore, OCR can be a supportive technology for visually impaired people. 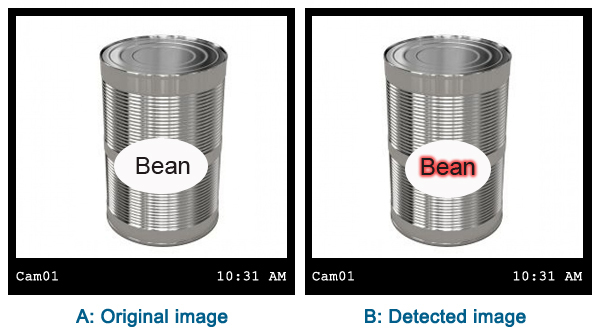 DrawColor: It is a value which helps us to determine the color of the detected characters. DrawThickness: It is an int value which helps us to determine the thickness of the detected characters. First parameter: It is a string value which is the path of the language file. Second parameter:It is a string value which is the language that you wish to use. Third parameter: It is an enum value, set to better or faster recognition. DetectionOccured: This is an event which is called when a text is detected. Content: A string value, it is the found appropiate text itself. Characters: A character block which stores the information about the detected characters. Text: This is a string value, the character itself. Cost: This is a float value, the lower it is, the more confident the result is. Region: This is a rectangle value, the region where the character is detected. With this method you can put the characters to White or Black lists which helps you to set the list of characters which you wish to display. This can be used to specify a white list for OCR. For example: specify "0123456789" to recognize digits only. First parameter: An enum value, here you can set the WhiteList or BlackList. Second parameter: A string value, here you should provide the characters which you would like to put on the lists. Third parameter: A bool value, if it is true it can make a better accuracy processing. 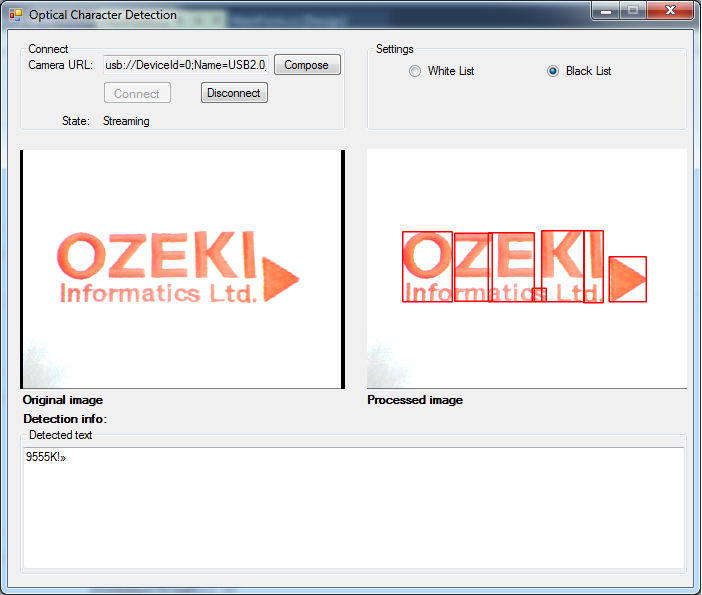 This guide provides you detailed information on how to implement optical character recognition in C# using the Ozeki Camera SDK. With the help of the examples and information provided on this webpage you will be able to edit and store your digitized texts or even create an application which can recognize a prohibited trademark before entering a concert.